Decorative Plates for Wall: Create Your Own Wall Display of Decorative Plates. Create Your Own Wall Display of Decorative Plates. Have you seen the stunning displays of plates hung on the wall in magazines and wondered how you could do it?? Wonder no more. Find everything you need at DecorativeDishes.net. 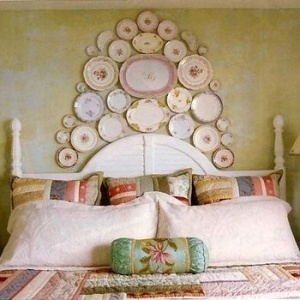 Check out this clever and dramatic shabby cottage look of a headboard accent made of decorative plates (picture found on Decorative Dishes on Pinterest ). Here you have a collection of pink decorative plates in the shabby chic style with a large oval platter surrounded by varying sizes of small, medium, and large decorative plates. These can be hung with adhesive decorative plate hangers (see how to use adhesive plate hangers video below) and arranged to follow the natural curve of the headboard. Clever! !